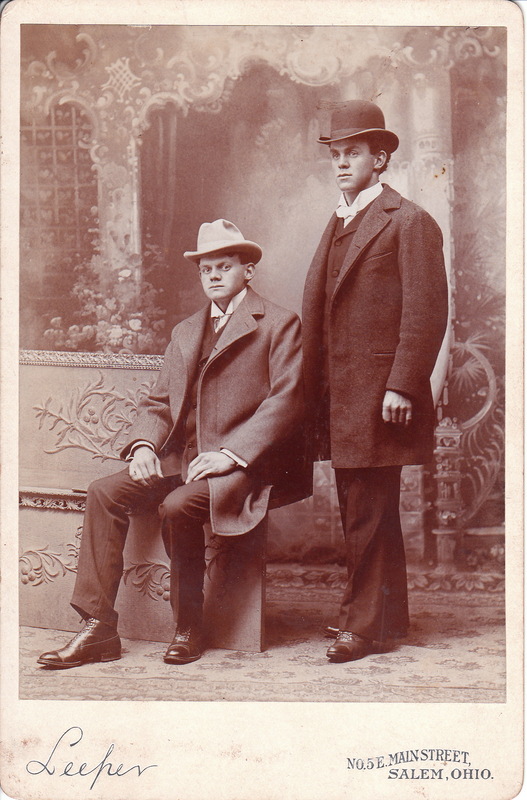 Two dapper men, looking quite professional, pose for their portrait at the Leeper studio, in Salem, Ohio. These men look like their on business. Are they lawmen? The gentleman who is standing is extremely handsome so perhaps the men are actors. The photographer is Burt Leeper. Leeper was born in Pennsylvania in 1865. He worked in Salem at the end of the nineteenth century. An article in a photographic journal (1900) cites Mr.Leeper as being part of a “Picture Trust”. It seems that he was part of a “price fixing” combine that was formed to resist the lowering of photographic studio prices as a result of fierce competition between photographers. Leeper and three other photographers agreed to match each others prices for services and goods. In addition, Leeper and two of the other photographers agreed to take turns being open for business on Sundays. The fourth photographer declined, preferring to stay closed on all Sundays.